Every toddler enjoys water play. Left to themselves, they can go on and on for hours. It is the best bet during summer season. If you are short of ideas, just give your toddler a tub full of water. He will happily splash for a long time. If he seems to lose interest, just add a couple of bath toys or small objects. A water spray can also add a lot of fun to water play. I wrote about the magic of outdoors sometime back. Outdoors can be extremely de-stressing if either or both of you are having a tough day. Just step out of the house. Watch him go digging in the mud or play with flowers or climb up the stairs or get excited about cats and dogs. Outdoors always have enough things to fascinate very young kids. If you have anything in several numbers, it works very well for toddler play. 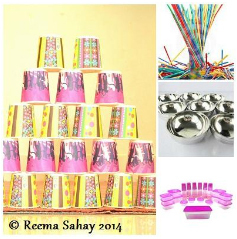 It could be anything – paper cups, cloth clips, stainless steel bowls, straws, plastic containers – to throw a few ideas. The trick is to have them in large numbers, say 50 paper cups or 30 bowls or 20 different kinds of plastic containers. I had saved all the scoops of his baby food and he would put them in a line or make a pile of them. Lots of plastic containers in different shapes and sizes also work very well. They can be used to make a tower or play the matching game where he can match the lid with its container. Or give them lots of plastic straws and give a box with a hole. Let them put those straws through the hole into the box. What works much more than off-the-shelf play dough is the regular dough [the one we use for making chapatis]. Just add some oil in the regular flour while making the dough [it will make the dough non-sticky]. You may add food colour. This is easy to make and edible too. Recently, we also tried the super-soft playdough at home with cornflour and conditioner using this recipe. It takes only a few minutes to prepare and it can be used for activities like Alphabet play. 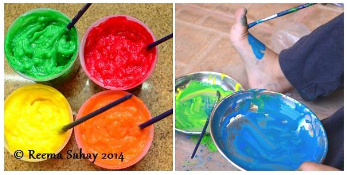 Colours, of all kinds, are always sure-shot hit with the toddlers – the messier, the better. We have tried the edible home-made, corn flour based colours using this recipe and the regular non-toxic colours available in the market. For some reason, our toddler ends up painting himself at the end of every colouring activity. Hope these ideas will give you some breather as well as fun times with your toddlers. Note: A few images have been sourced through Google.